One of them misses their bed. Another, their doll with the dark eyes. A third dreams of a time before the pillow was an enemy. The war in Syria has been going on for six years. 2016 was the worst year so far for the children. At least 652 children were killed. More than two million children have been displaced within or outside the country. They’ve had to leave their friends, their homes and their beds. 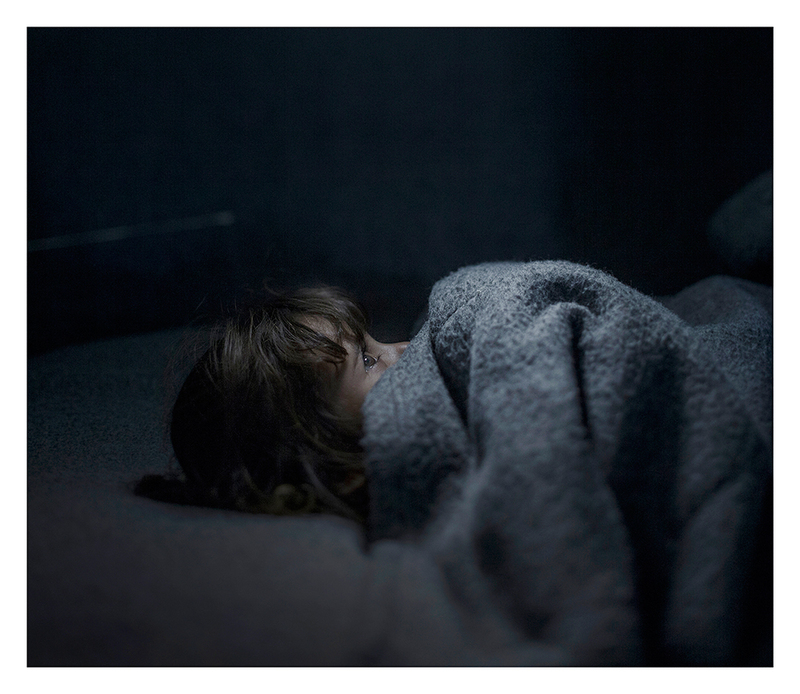 Some of these children have been invited to show where they now sleep, as all that once was no longer remains. Magnus Wennman, winner of two World Press Photo Awards and five-time winner of Photographer of the Year in Sweden, has met refugees in countless refugee camps and on their way through Europe. The story of when the night comes is a living history with an undetermined end. MOSUL, IRAQ Dina lies under a warm blanket in her cradle. The family was forced to flee the fighting between ISIS and the Iraqi army in Mosul and is now living temporarily in one of the many abandoned houses in the liberated part of the city. There is nothing to eat or drink, and no fuel, says her mother. Debaga, Iraq. Maha and her family fled from the village Hawiga outside Mosul seven days ago. The fear of Isis and the lack of food forced them to leave their home, her mother says. 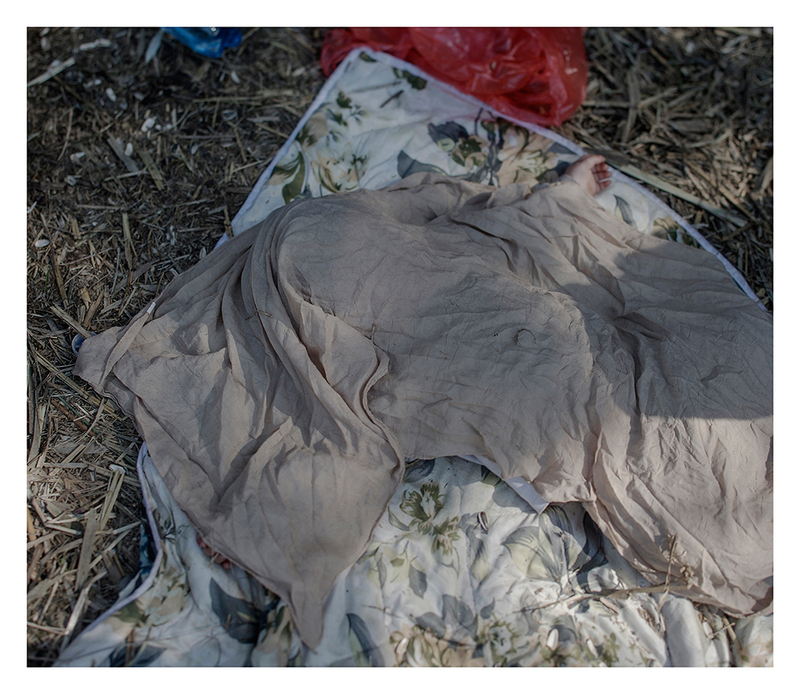 Now Maha lays on a dirty mattress in the overcrowded transit center in Debaga refugee camp. 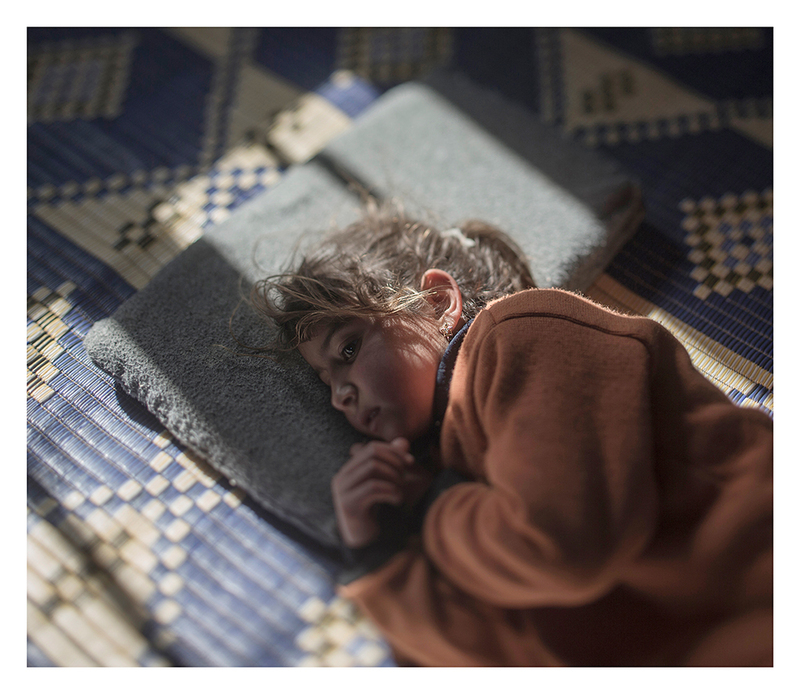 ”I do not dream and I’m not afraid of anything anymore”, Maha says quietly, while her mother’s hand strokes her hair. Horgos, Serbia. Back home in Baghdad, the dolls, the toy train, and the ball are left; Lamar often talks about these items when home is mentioned. The bomb changed everything. The family was on its way to buy food when it was dropped close to their house. It was not possible to live there anymore, says Lamar’s grandmother, Sara. After two attempts to cross the sea from Turkey in a small, rubber boat, they succeeded in coming here to Hungary’s closed border. Now Lamar sleeps on a blanket in the forest, scared, frozen, and sad. Horgos/Roszke. Mahdi is one and one half years old. He has only experienced war and flight. 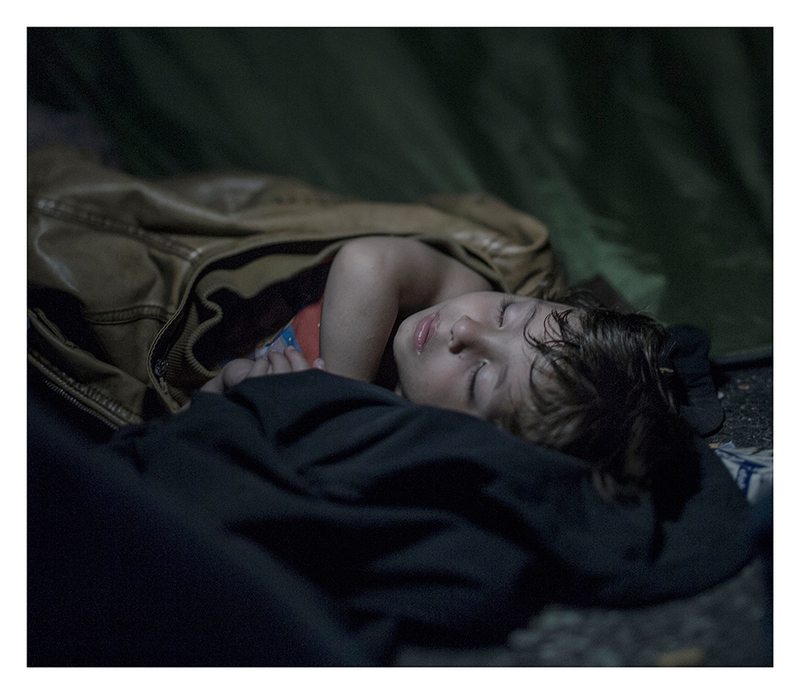 He sleeps deeply despite the hundreds of refugees climbing around him. They are protesting against not being able to travel further through Hungary. On the other side of the border, hundreds of police are standing. They have orders from the Primary Minister Viktor Orbán to protect the border at every cost. The situation is becoming more desperate and the day after the photo is taken, the police use tear gas and water cannons on the refugees. Athen, Greece. Abdul Karim Addo has no money left. He bought a ferry ticket to Athens for his last euros. 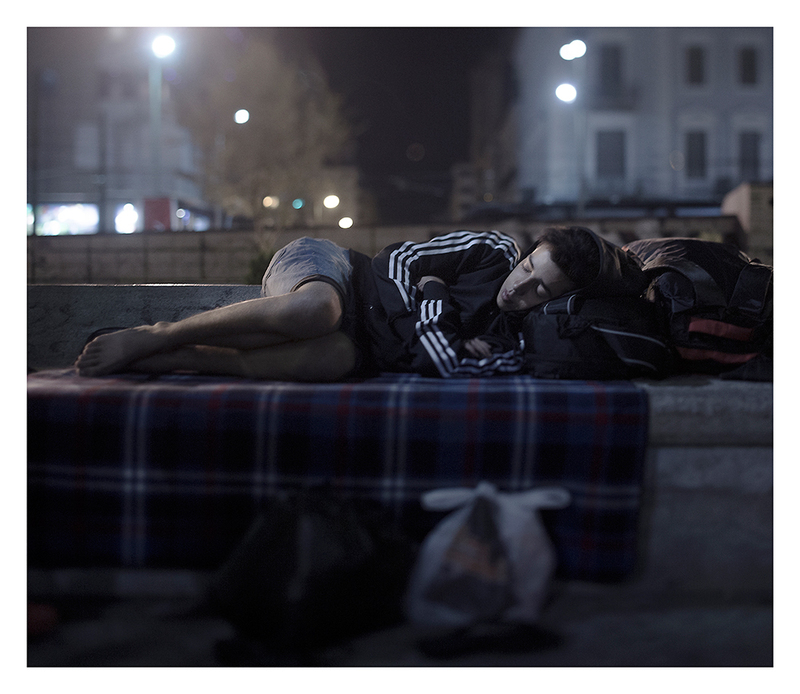 Now he spends the night in Omonoia Square, where hundreds of refugees are arriving every day. Here, smugglers are making big money arranging false passports as well as bus and plane tickets to people in flight – but Abdul Karin is not going anywhere. He is able to borrow a telephone and call home to his mother in Syria, but he is not able to tell her how bad things are. He unfolds his blanket in the middle of the square and curls up in the fetal position. Horgos/Roszke. Even sleep is not a free zone; it is then that the terror replays. 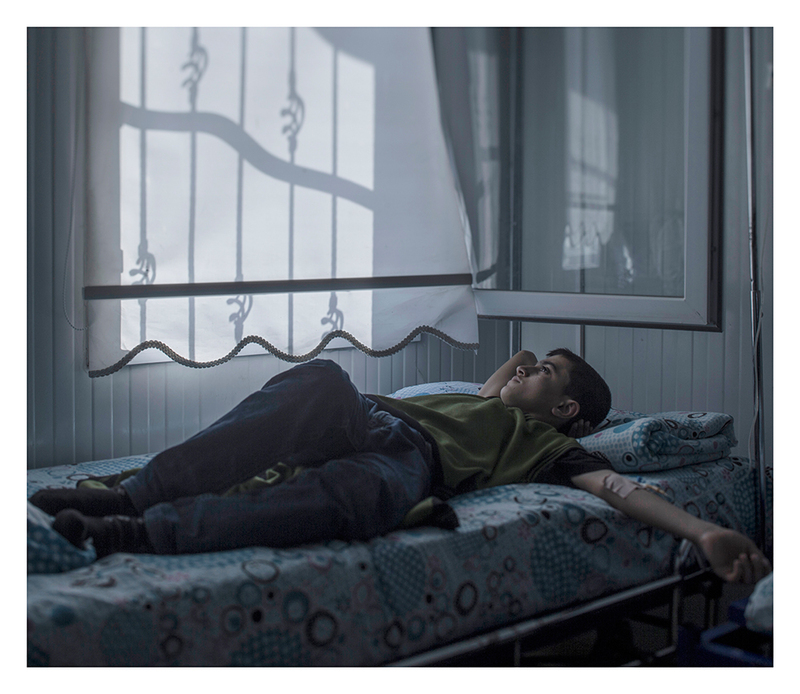 Ahmad was home when the bomb hit his family’s house in Idlib. Shrapnel hit him in the head, but he survived. His younger brother did not. The family had lived with war as their nearest neighbor for several years, but without a home, they had no choice. They were forced to flee. 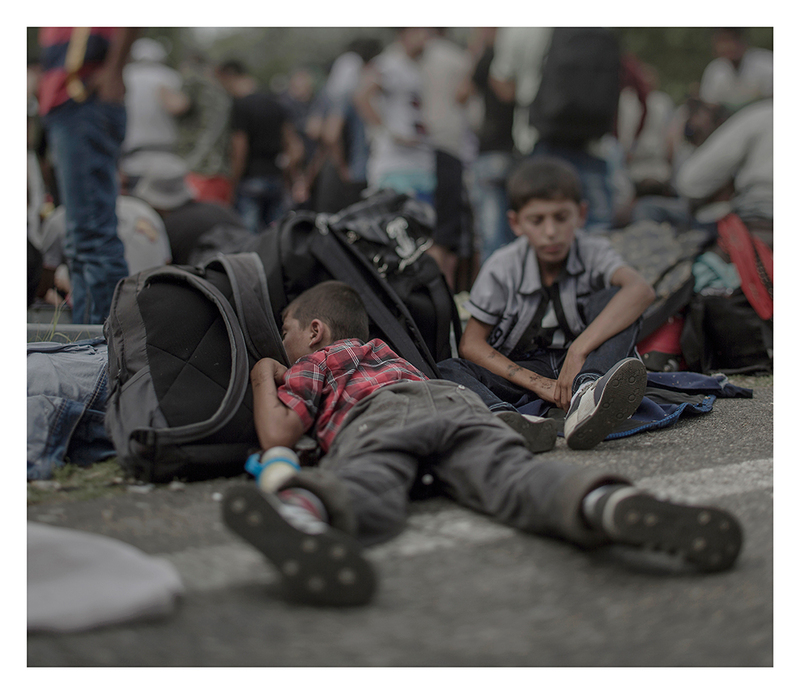 Now Ahmad lays among thousands of other refugees on the asphalt along the highway leading to Hungary’s closed border. This is day 16 of their flight. 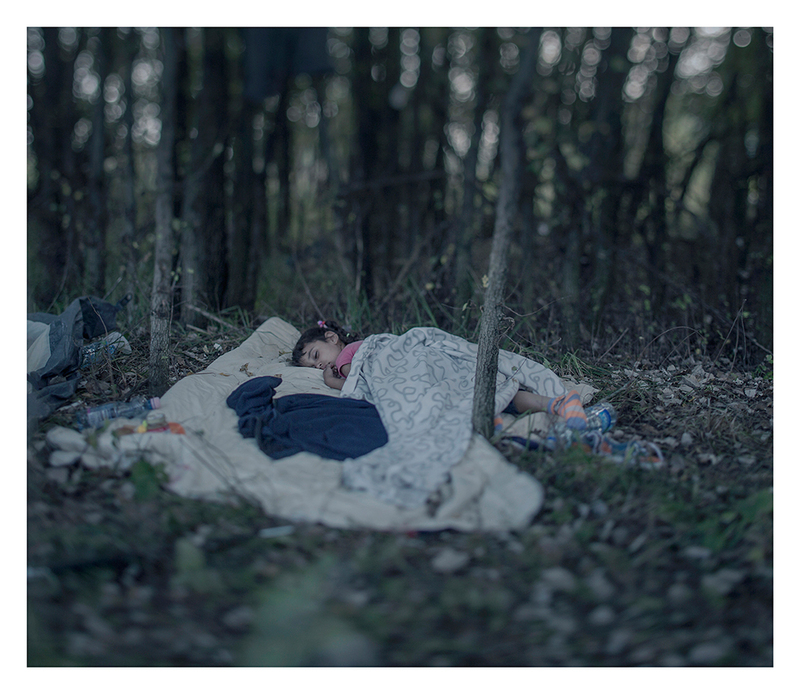 The family has slept in bus shelters, on the road, and in the forest, explains Ahmad’s father. Shehd loves to draw, but more recently, all of her drawings have had the same theme: weapons. 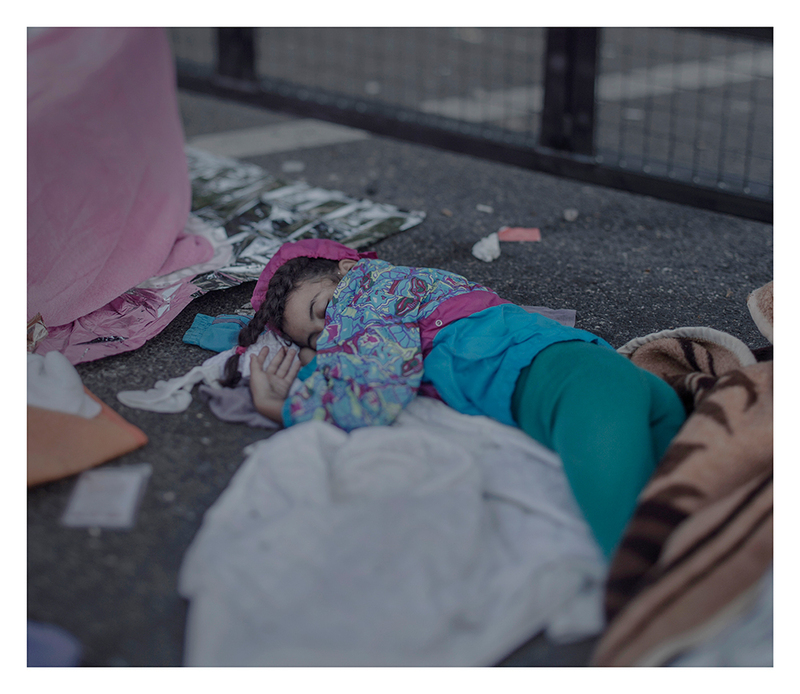 “She saw them all the time, they are everywhere,” explains her mother when the little girl sleeps on the ground alongside Hungary’s closed border. Now she does not draw at all. The family brought neither paper nor crayons with them on their flight. Shehd does not play anymore either. The escape has forced children to become adults and share concern for what happens in an hour or a day. The family has had difficulty finding food during their wandering. Some days, they have had to make do with apples they were able to pick from trees along the road. If the family had known how hard the journey would be, they would have chosen to risk their lives in Syria. Roszke/Horgos. 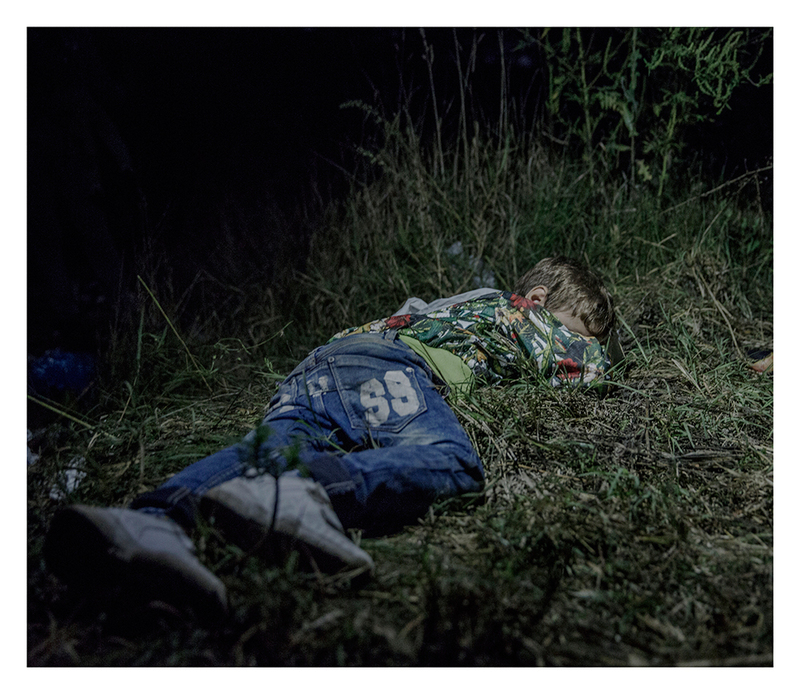 In the very front, just alongside the border between Serbia and Hungary by the 4-meter-high iron gate, Sham is laying in his mother’s arms. Just a few decimeters behind them is the Europe they so desperately are trying to reach. Only one day before, the last refugees were allowed through and taken by train to Austria. But Sham and his mother arrived too late, along with thousands of other refugees who now wait outside the closed Hungarian border. BELGRAD, SERBIA. Abdullah has a blood disease. 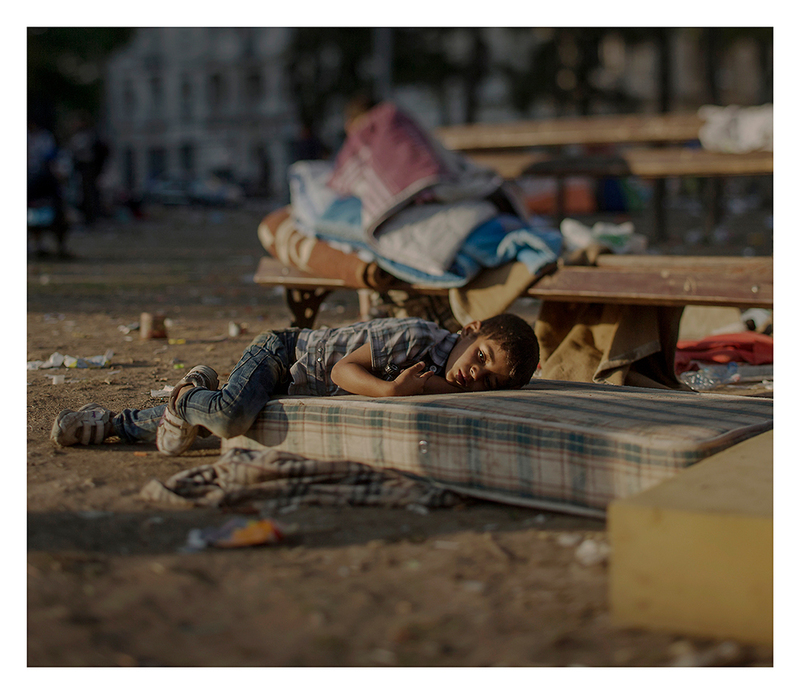 For the last two days, he has been sleeping outside of the central station in Belgrade. He saw the killing of his sister in their home in Daraa. “He is still in shock and has nightmares every night,” says his mother. 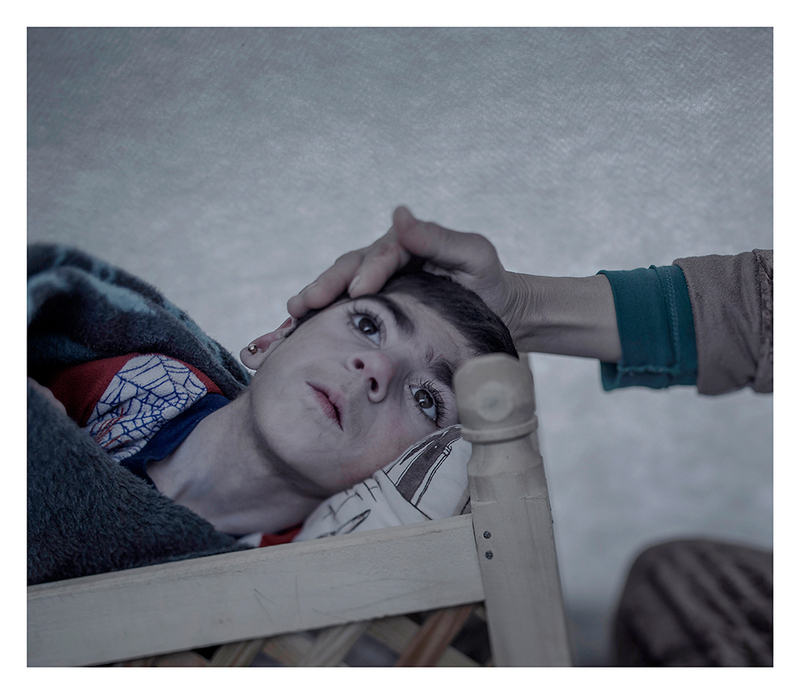 A bdullah is tired and is not healthy, but his mother does not have any money to buy medicine for him. HORGOS, SERBIA. It is 34 degrees Celcius. The flies crawl on Juliana’s face and she shifts uneasily in her sleep. Juliana’s family has been walking through Serbia for two days. This is the latest phase of a flee that started three months ago. 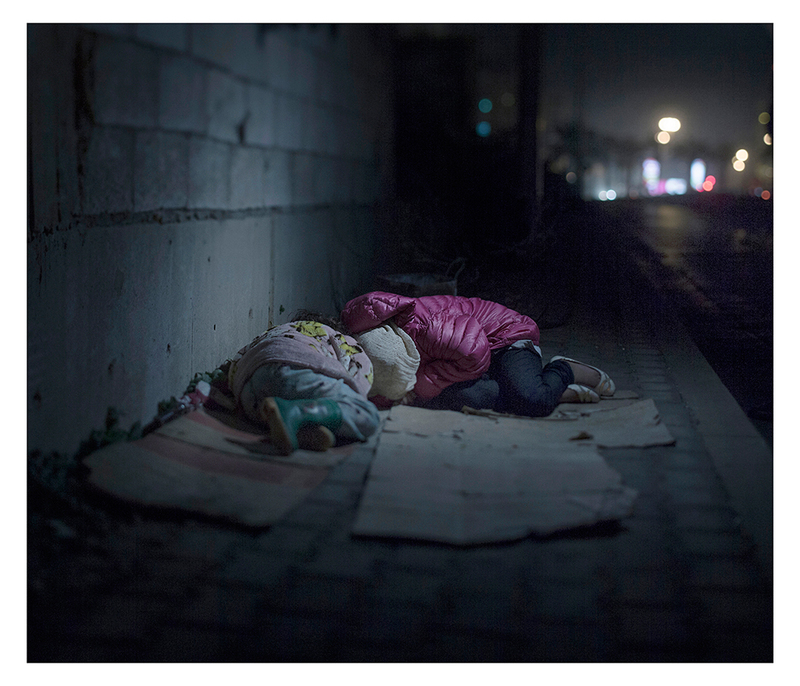 The girl’s mother lays her thin shawl over her daughter on the ground. Fatima calms down. A few meters away from their resting place, feet are tramping by in a never-ending flow of people. It is the end of August and Hungary is about to barricade themselves with barbed wire to shut out this stream of refugees. But for a few more days, it is possible to pass through the border city of Horgos. As soon as evening comes, Juliana’s family will go for it. HORGOS, SERBIA. It is after midnight when Ahmed falls asleep in the grass. The adults are still sitting around, formulating plans for how they are going to get out of Hungary without registering themselves with the authorities. Ahmed is six years old and carries his own bag over the long stretches that his family walks by foot. 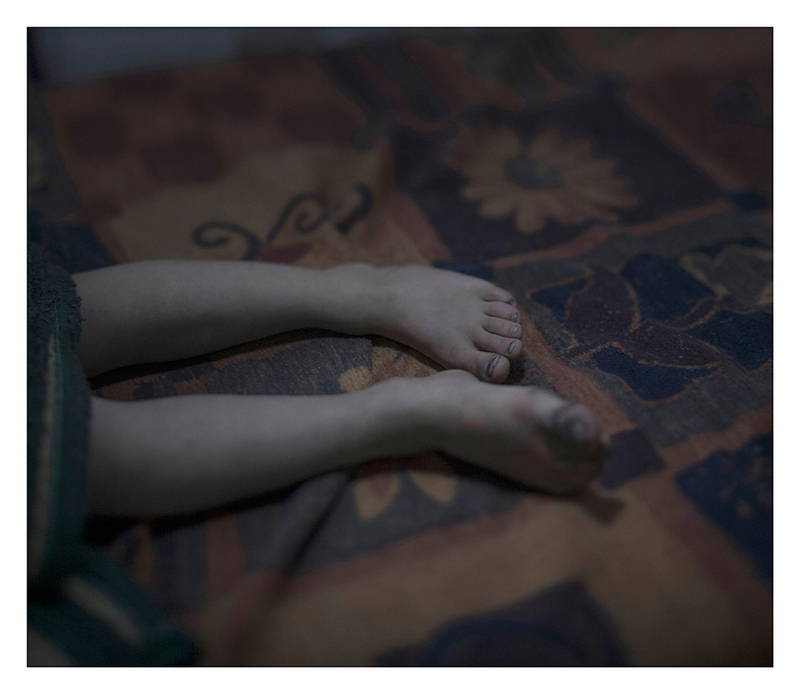 “He is brave and only cries sometimes in the evenings,” says his uncle, who has taken care of Ahmed since his father was killed in their hometown Deir ez-Zor in northern Syria. SURUC. Shiraz, 9, was three months old when she was stricken with a severe fever. The doctor diagnosed polio and advised her parents to not spend too much money on medicine for the girl who ”didn’t have a chance.” Then the war came. Her mother, Leila, starts crying when she describes how she wrapped the girl in a blanket and carried her over the border from Kobane to Turkey. Shiraz, who can’t talk, received a wooden cradle in the refugee camp. She lies there. Day and night. NIZIP. Mohammed, 13, loves houses. Back home, in Aleppo, he used to enjoy walking around the city looking at them. Now, many of his favourite buildings are gone, blown to pieces. Lying in his hospital bed, he wonders whether he will ever fulfill his dream of becoming an architect. – The strangest thing about war is that you get used to feeling scared. I wouldn’t have believed that, says Mohammed. AZRAQ. Iman, 2, has pneumonia and a chest infection. This is her third day in this hospital bed. – She sleeps most of the time now. Normally she’s a happy little girl, but now she’s tired. She runs everywhere when she’s well. She loves playing in the sand, says her mother Olah, 19. SURUC. 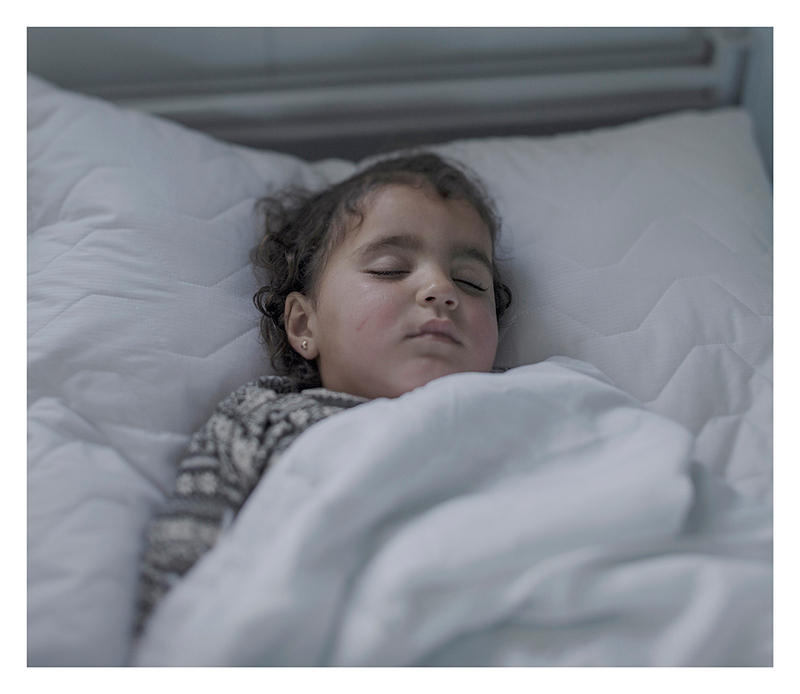 There’s a difference between closing your eyes and sleeping, as six-year-old Gulistan knows. She prefers to shut her eyes and just pretend, because every time she really falls asleep, the nightmares start. – I don’t want to sleep here. I want to sleep at home, she says. She misses the pillow she had in Kobane. Sometimes she lies against her mother and uses her as a pillow. AZRAQ. 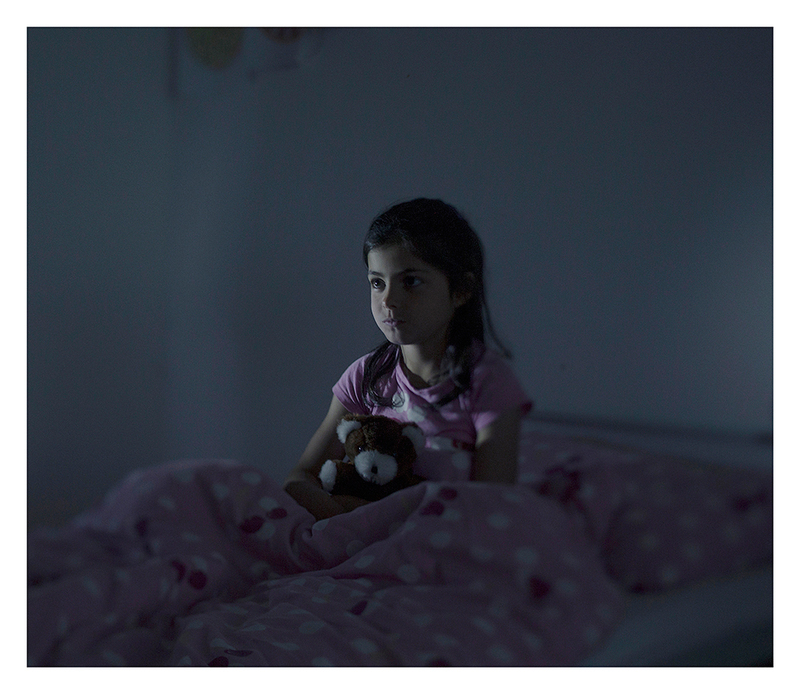 Five-year-old Tamam is scared of her pillow. She cries every night at bedtime. 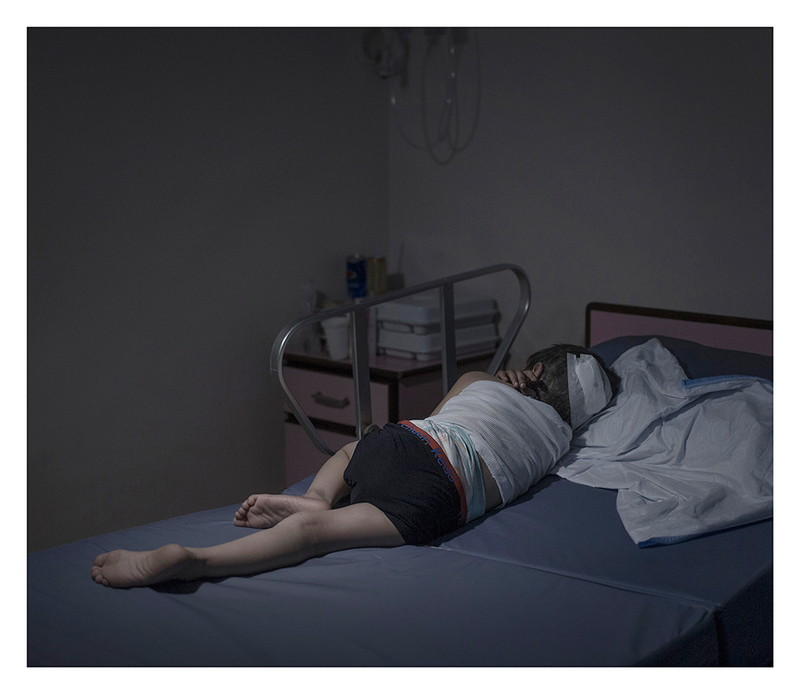 The air raids on her hometown of Homs usually took place at night, and although she has been sleeping away from home for nearly two years now, she still doesn’t realize that her pillow is not the source of danger. MAJDAL ANJAR. When Selam, 37, puts Esra, 11, Esma, 8, and Sidra, 6, to bed, she takes comfort from the knowledge that her children are safe and won’t come under attack during the night. What saddens her is the fact that they constantly dream about their father, who disappeared after being abducted, and wake up distraught. – I often dream that Daddy is bringing me candy, says Sidra. AMMAN. 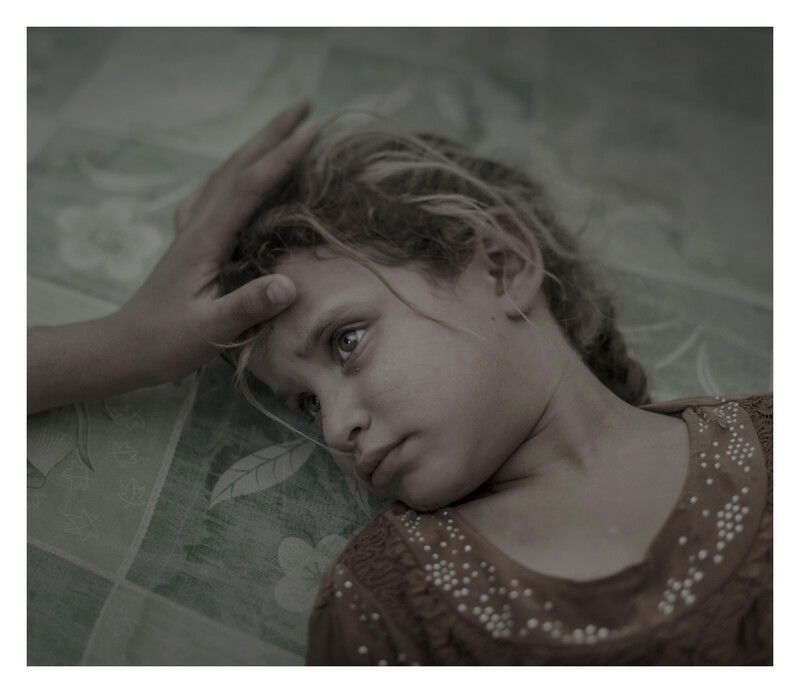 Eight-year-old Maram had just come home from school when the rocket hit her house. A piece of the roof landed right on top of her. 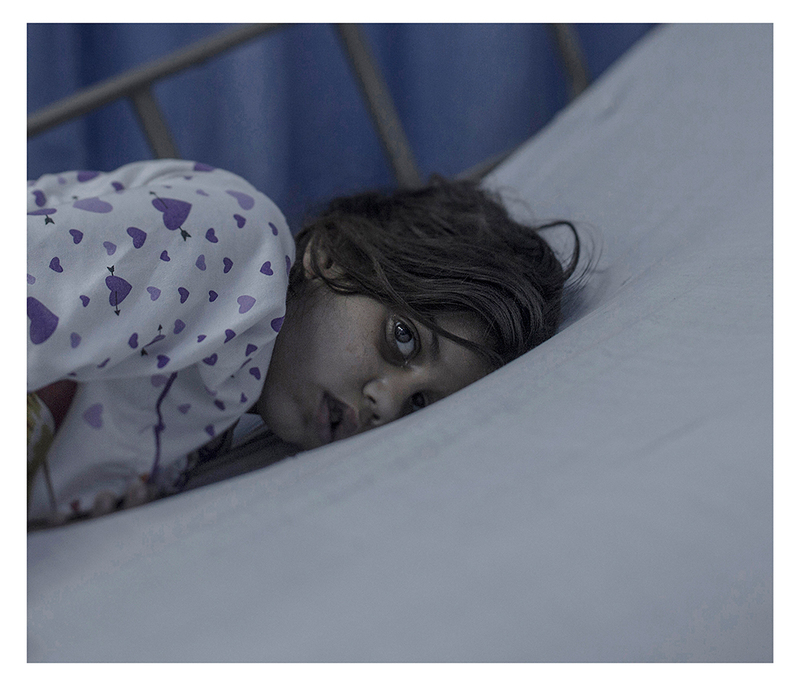 Her mother took her to a field hospital, and from there she was airlifted across the border to Jordan. Head trauma caused a brain hemorrhage. For the first 11 days, Maram was in a coma. She is now conscious, but has a broken jaw and can’t speak. BEIRUT. Ralia, 7, and Rahaf, 13, live on the streets of Beirut. They are from Damascus, where a grenade killed their mother and brother. Along with their father, they have been sleeping rough for a year. They huddle close together on their cardboard boxes. Rahaf says she is scared of “bad boys,” at which Ralia starts crying. AMMAN. Moyad, 5, and his mother needed to buy flour to make a spinach pie. Hand in hand, they were on their way to the market in Dar’a. They walked past a taxi in which someone had placed a bomb. Moyad’s mother died instantly. The boy, who has been airlifted to Jordan, has shrapnel lodged in his head, back and pelvis. DAR-EL-IAS. Walaa, 5, wants to go home. She had her own room in Aleppo, she tells us. There, she never used to cry at bedtime. 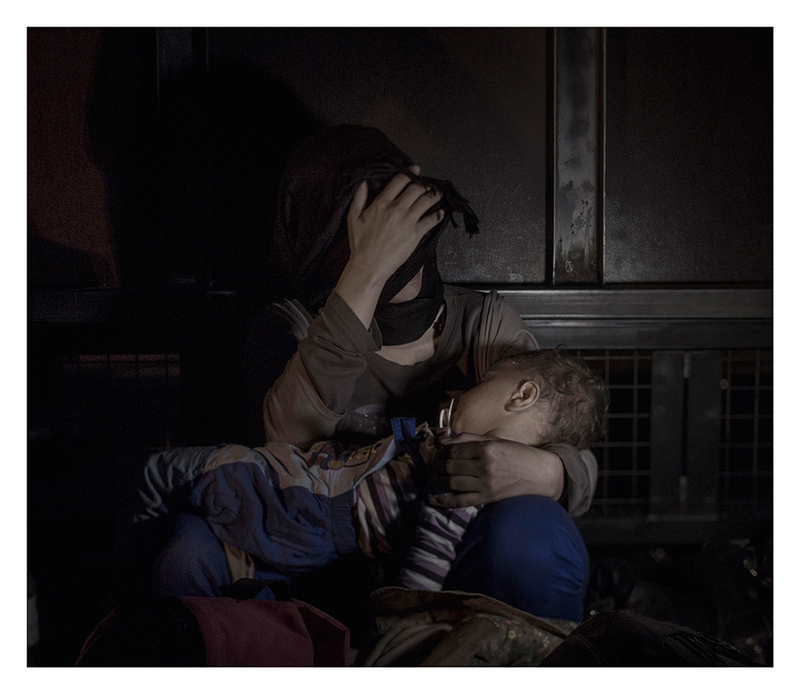 Here, in the refugee camp, she cries every night. Resting her head on the pillow is horrible, she says, because nighttime is horrible. That was when the attacks happened. 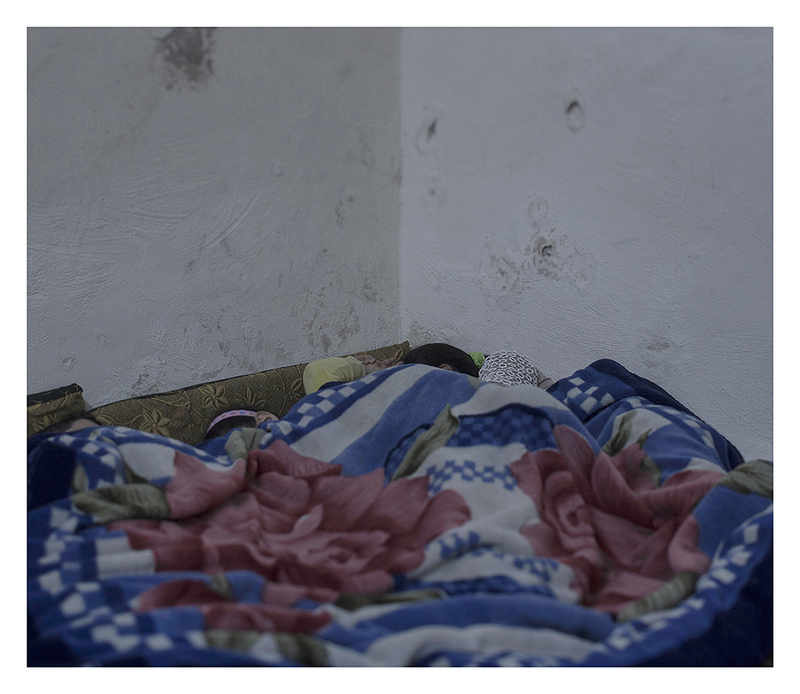 By day, Walaa’s mother often builds a little house out of pillows, to teach her that they are nothing to be afraid of. ZAHLE FAYDA. 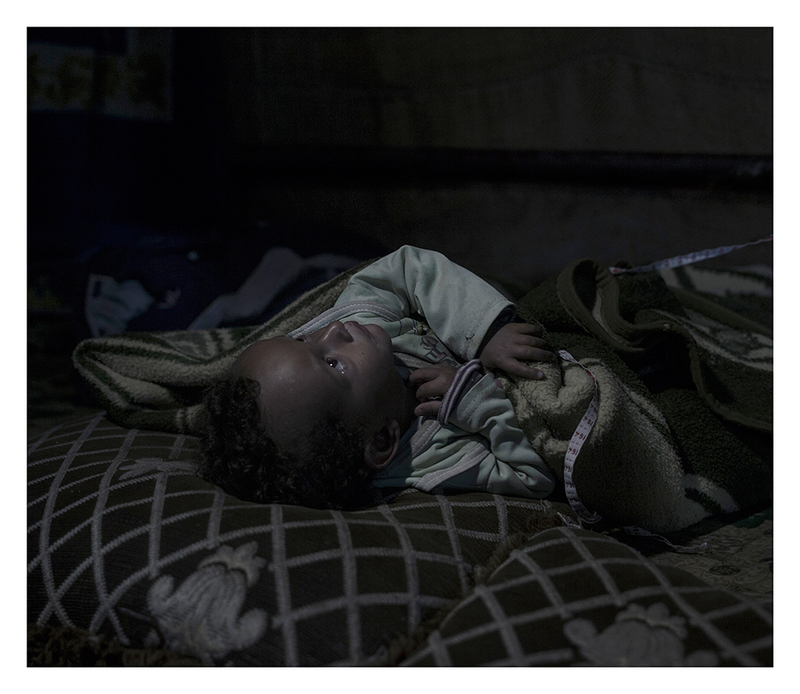 Amir, 20 months, was born a refugee. His mother believes her son was traumatized in the womb. “Amir has never spoken a single word,” says Shahana, 32. In the plastic tent where the family now lives, Amir has no toys, but he plays with whatever he can find on the ground. 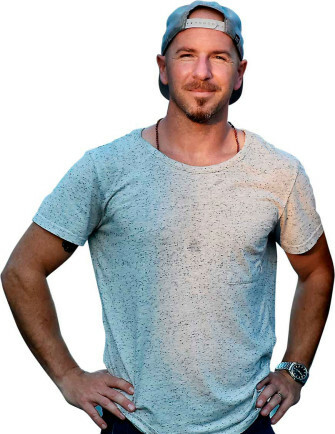 “He laughs a lot, even though he doesn’t talk,” says his mother. AZRAQ Fara, 2, loves soccer. Her dad tries to make balls for her by crumpling up anything he can find, but they don’t last long. Every night, he says goodnight to Fara and her big sister Tisam, 9, in the hope that tomorrow will bring them a proper ball to play with. All other dreams seem to be beyond his reach, but he is not giving up on this one. NORBERG, SWEDEN. Every night, Fatima dreams that she’s falling from a ship. Together with her mother, Malaki, and her two siblings, Fatima fled from the city Idlib when the Syrian national army senselessly slaughtered civilians in the city. After two years in a refugee camp in Lebanon, the situation became unbearable and they made it to Libya where they boarded an overcrowded boat. On the deck of the boat, a very pregnant woman gave birth to her baby after twelve hours in the scorching sun. The baby was a stillbirth and was thrown overboard. Fatima saw everything. When the refugee’s boat started to take on water, they were picked up by the Italian coastguard. The situation is urgent! UNHCR is on-site in Syria’s neighboring countries, the Mediterranean and along escape routes throughout Europe, to provide refugees with shelter, mattresses, blankets, food and other emergency assistance. 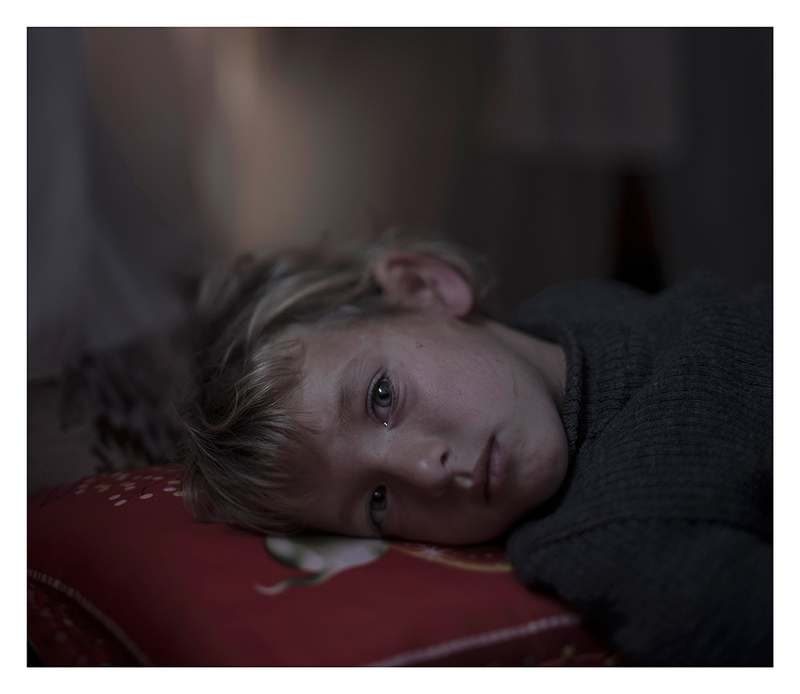 Swish a donation to 90 01 645 and include the text SYRIA, or send the text message SYRIEN170 to 729 80 to donate SEK 170. You can also give through the website fnflykting.se or via Plusgiro 90 01 64-5.